Love mangoes? 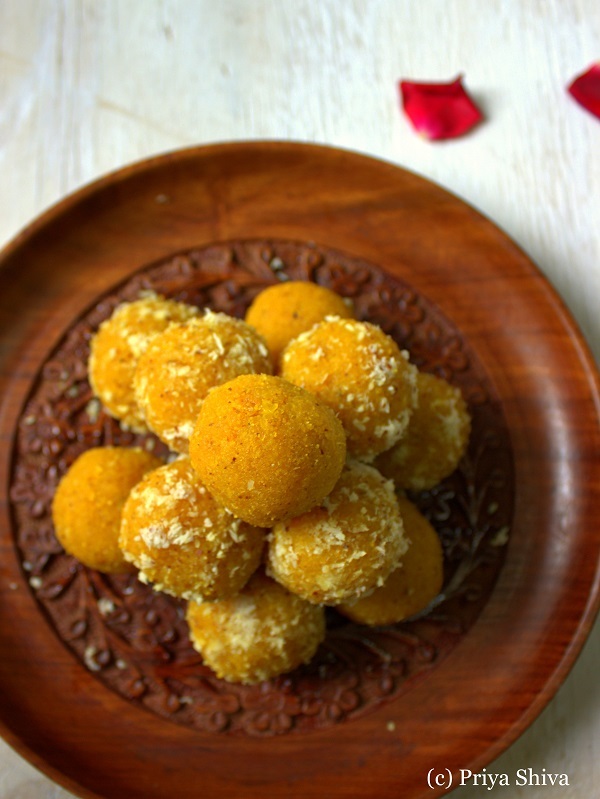 Then you got to try out these delicious mango coconut ladoo. It is made with a combination of two of my favorite ingredients – mango and coconut. Will you believe that you just need 4 ingredients and flat 20 minutes to make this sweet? Yes, making this mango coconut ladoo is that easy and I assure you that your family will adore you for it. You all know I’m a big sweet fan. I don’t need a reason to make sweets but I had plenty this time. I’m having the best time in Bangalore seeing new places and enjoying quality time with family. My happiness doubles when I share it with you all. 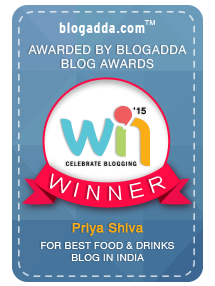 After all, you are the ones who read my blog and keep encouraging me to post more. 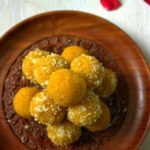 You can also check out other mango recipes on my blog like – Mango Ice Cream, Mango salad, Mango Lassi etc..So, sharing yet another sweet recipe – Mango Coconut Ladoo. Hope you all try it out and enjoy this mango season. Keep ½ cup of the grated coconut separately to use it in the end. Take out the pulp from the mango by discarding the skin and seed. Add in your blender and blitz it to make a puree. Now add condensed milk, mango puree and coconut into a heavy bottom pan and mix well. Heat the mixture and keep stirring so that it does not stick to the bottom of the pan. Once it starts boiling, lower the flame and cook on a low flame till the mixture starts leaving the sides of the pan or starts thickening. It will take 4-5 minutes. Remove the pods from cardamom, powder it and add in the pan and mix well. Take a small portion of the mixture. Roll into round shape ball. Roll in the reserved coconut. Enjoy these ladoo with your family and friends. I have used Alphonso mango. 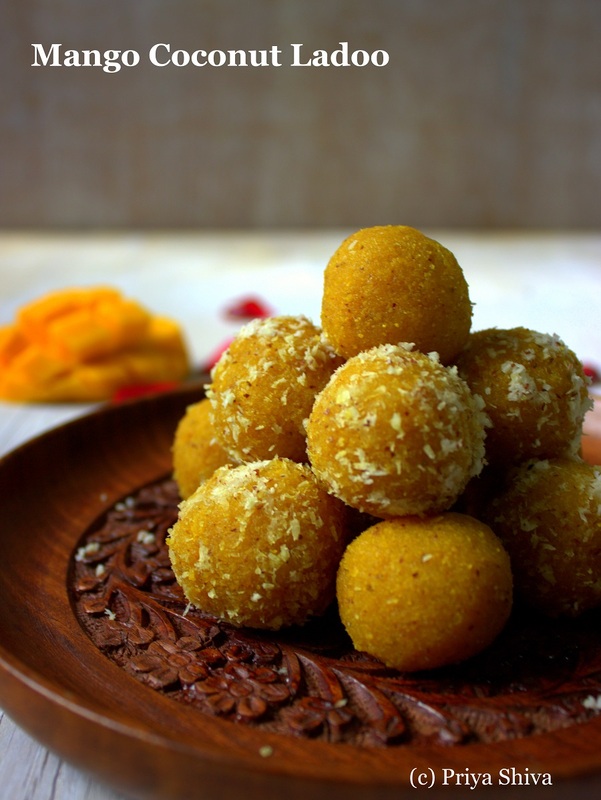 The color of the ladoos depends on the variety of mango. You can add extra sugar for more sweetness. Really cool. Never seen this recipe before. Does not look hard to make but sure to impress the guests. I had no idea what ladoo was, but I love all 4 ingredients here! I’d scarf down like 5 in one sitting! I have never heard of this but now I really want to try it!! I love Ladoo! This is so simple and quick, it will probably made every day in my kitchen! Yum! This is deliciousness overloaded !!! Love it..
It’s Delicious. I will Soon Try. I hope you will also like my site. 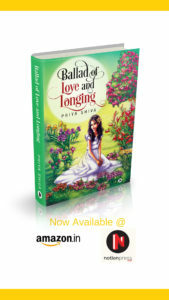 It is about Vegetarian recipes and India Tourism. How long does this last after making? Do I have to store it in the refrigerator? It is better to refrigerate and you can store it for a weeks time. How did you are choosing sweet & easy recipes?. Very nice rcipe.